121Time have a really neat online configurator program that allows you to design your own watch by selecting from their extensive range of components and colour schemes. You can save your designs to your personal "safe" for future reference and, when you choose to buy, they'll assemble your watch at their workshop in Switzerland and ship it to you in around ten days. 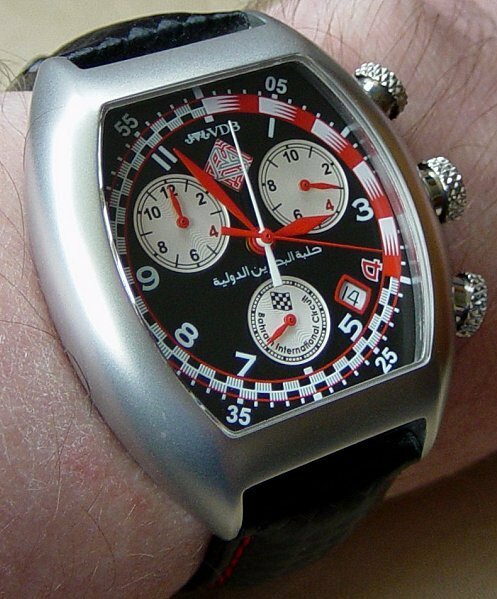 Here, I've selected an ETA quartz chronograph movement with Titanium-Carbide coated stainless steel case, red aluminium tachymeter bezel, waterproofing to 30M., mineral crystal, "race" style dial and hands with yellow subdial/rehaut markers, red chronograph and sweep seconds hands and a red Hirsch Carbon strap. One for the Tifosi perhaps? I'm rather lost for words when it comes to describing this wonderful watch, so I'll let Aquanautic do it for me: "Aquanautic, inspired by water, is located in the Molard Square Clock Tower in Geneva. 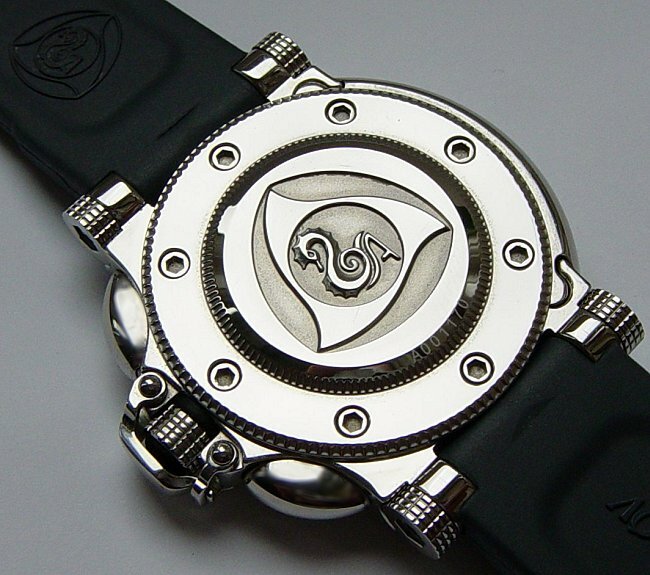 Aquanautic watches define themselves by their pioneer spirit and totally steel nature." 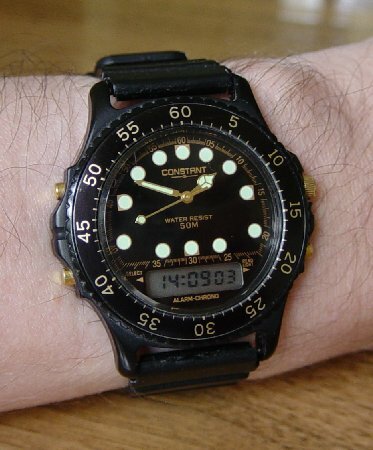 Now we've got that out of the way, what I can tell you is that this watch weighs a ton, is beautifully made and that the bezel and strap are changeable for a wide range of alternatives by unscrewing the allen bolts that secure them with the specially provided screwdriver. The back of the watch is as spectacular as the front! All in all, it's a wonderful piece of kit and I love it! 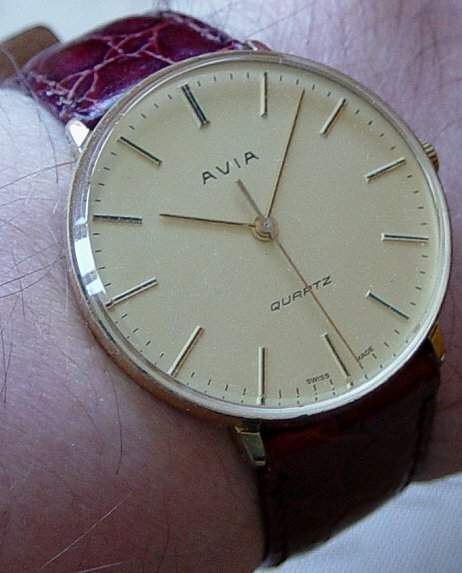 An Avia quartz I bought in the early 1980's. This watch now has a replacement 5 jewel Swiss movement after I accidentally smashed the original whilst at work. 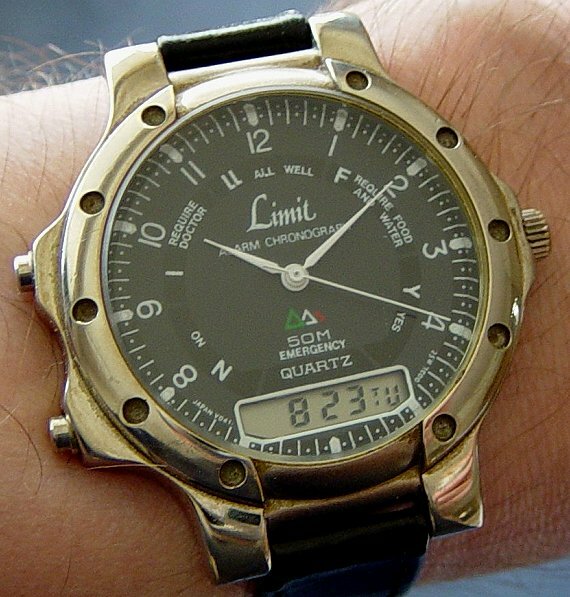 Not so much a "watch", this is more of a "wrist-top computer". As well as all the normal watch functions including a calendar and chronograph, this device sports an altimeter, thermometer and barometer. I've used it whilst winter mountaineering where it's proved invaluable as a navigational aid. Ease of use is exemplary, with large, firm buttons that are easy to press even whilst wearing gloves. The optional elastic wrist band is perfect for wearing over the sleeve of a waterproof jacket which makes the watch easy to see at a glance and also helps prevent the thermometer being affected by body temperature which occurs if the watch is worn against the skin. Battery life is short on this original model (something I believe the current version addresses) and end-user battery replacement is tricky and not recommended. Also there is no backlight. Apart from these minor inconveniences, it's a super bit of kit. The 12 jewel Japanese Miyota quartz movement in this watch provides a multitude of functions including a chronograph that measures 1/50th seconds up to a total of 12 hours, an alarm, quick-set date and battery end-of-life indication. A tough watch with uni-directional rotating bezel, screw-down crown, water resistant to 100M and pictured here on a grey NATO strap. 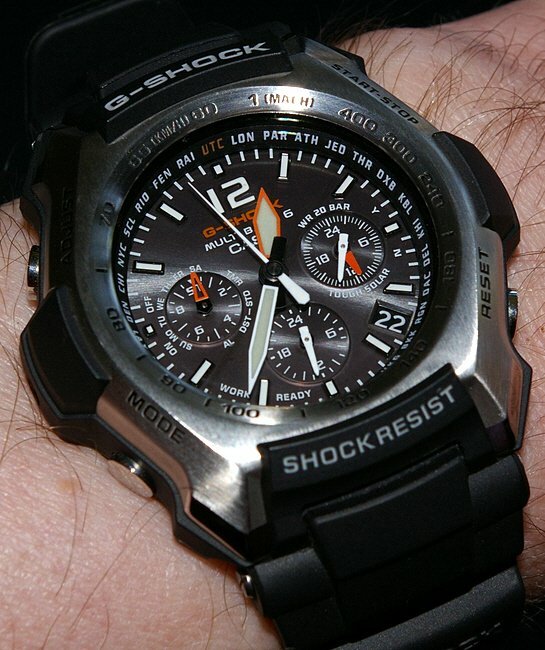 No watch collection can be complete without an example of a Casio G-Shock. 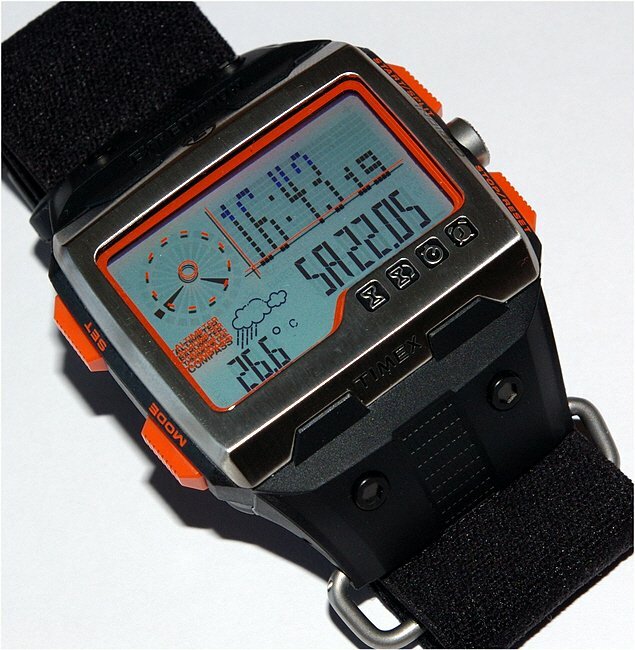 The first G-Shock was released in 1983 pioneering a range of watches that are intelligently designed, multi-functional and durable, being highly-resistant to the effects of water, dust, mud, magnetism and rough treatment! The GW-2000 is the first G-Shock aimed at aviators, although its 200M water resistance, tachymeter bezel and world time functions make it suitable for all kinds of sporting, outdoor and travel activities. The watch is solar powered and time setting is radio-controlled automatically with multiband reception available from transmitters in the UK, USA, Germany, Japan and China. 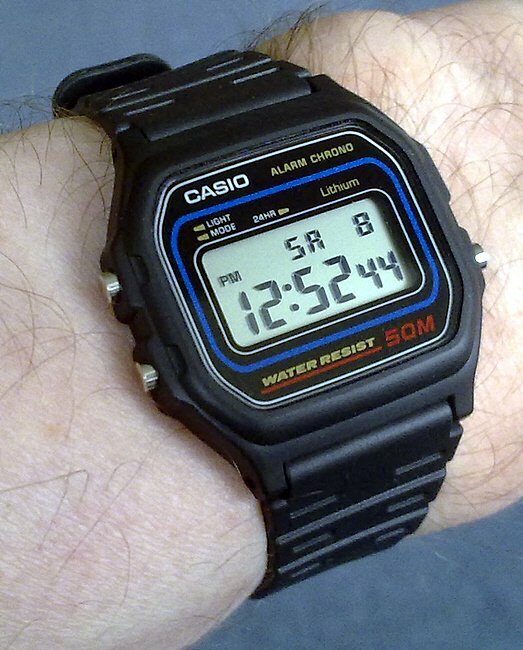 I always wanted one of these Casio LCD's when they were considered the height of tech and all the rage in the early 80's, but I couldn't really afford one. Hey, I was still at school at the time! Since then the basic design has achieved something of a classic status. This modern version replaces the original stainless steel with resin which is both hard-wearing and comfortable and has a mid-size case which is suitable for gents or ladies and all ages. And the price has fallen dramatically too of course (taking inflation into account) with this watch coming in at a little over �10. Perfectly simple and simply perfect! 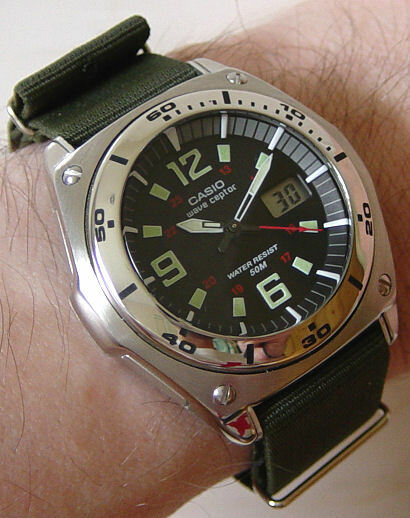 Casio's "Wave Ceptor" watches are radio controlled. 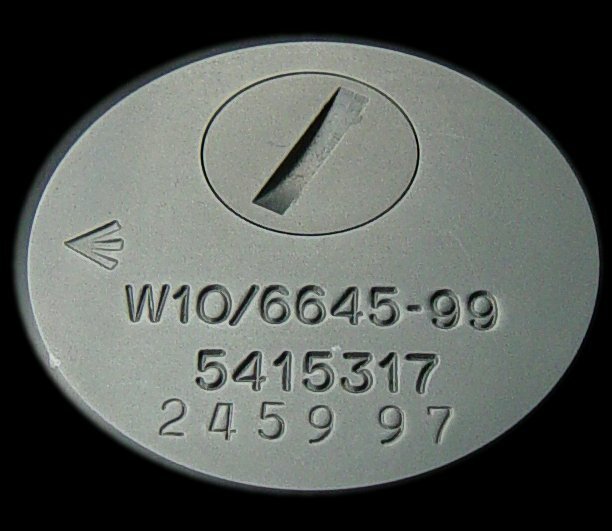 They contain radio receivers which pick up time signals broadcast from various transmitters around the globe. On receiving the time signal, the watch automatically adjusts itself so it is always telling precisely the right time. 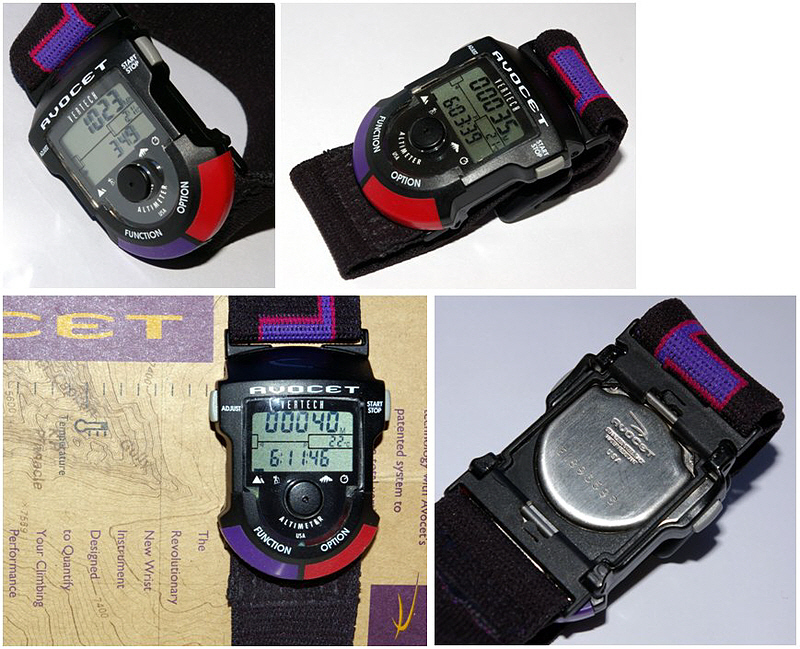 This watch is "quad band", and can automatically set itself to the correct time upon receiving signals from either the UK, Germany, Japan or USA. 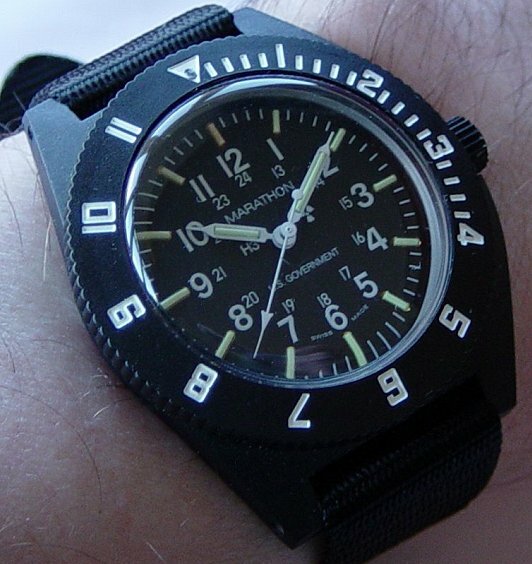 I've changed the supplied metal bracelet on this watch for a green NATO strap. This is a "dual band" Wave Ceptor which can receive radio signals from both the UK and German transmitters. 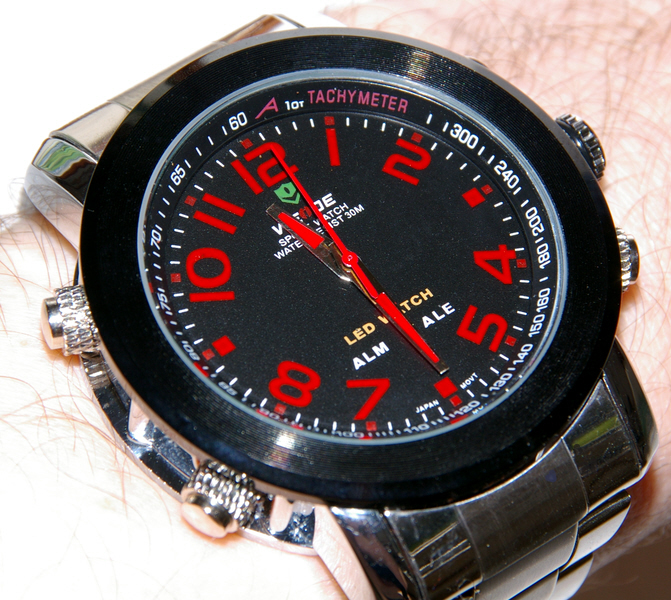 It's a multi-function watch which includes a chronograph, dual time, 24-hour hand and alarm. The ace up its sleeve though is that it is solar-powered, so this watch not only never needs adjusting, it also never needs winding or the battery changing. I've changed the supplied metal bracelet for a grey NATO style strap. 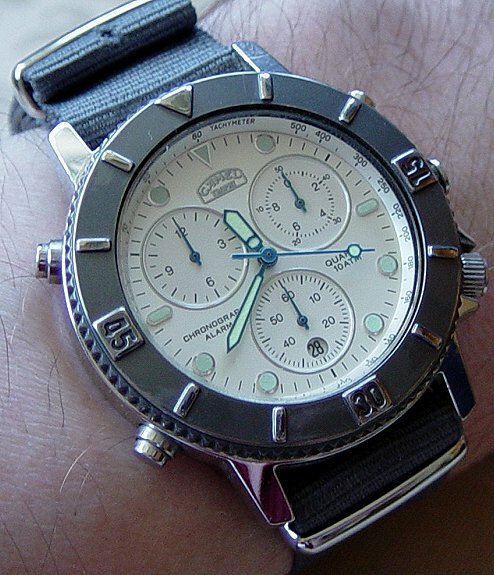 A very cheap watch (�14) purchased from the Argos Catalogue in 1993, I wore this watch at an altitude of 17,000ft. in the Himalayas. Smashed against rocks, exposed to sub-zero temperatures and immersed in freezing glacial rivers, it still works perfectly today :-) The LCD module allows the watch to display a second time zone and has all the usual chronograph and alarm features. 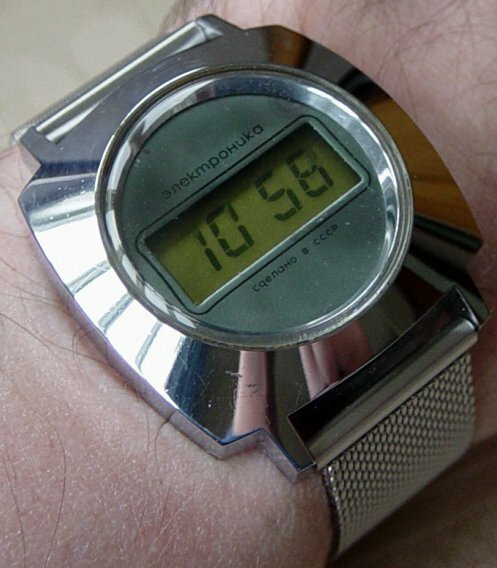 I loath the faux rotating bezel though! A friend gave me this watch after receiving two as free gifts from the online clothing and accessories company, Cotton Traders, which was formed by former England rugby captains Fran Cotton and Steve Smith. 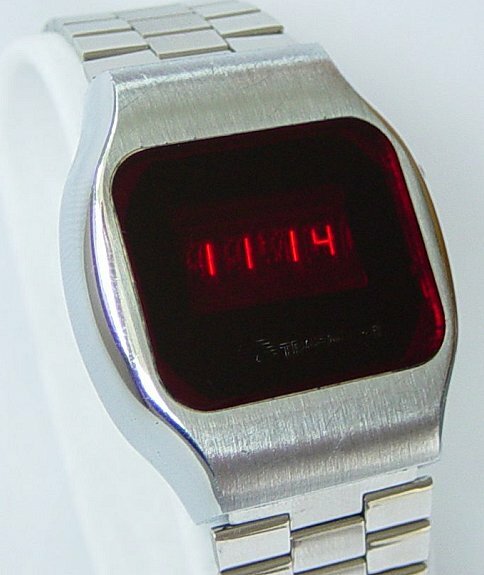 This quartz watch has a transparent plastic case, faux rotating bezel, a button at 2 O'Clock which appears to do nothing, and a tyre tread pattern rubber strap. 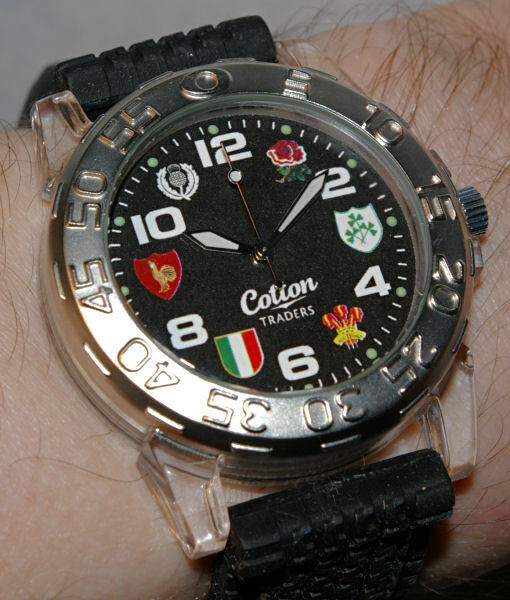 The low-budget build quality is more than compensated for by the terrific dial which features the emblems of the Six Nations Rugby teams - England, Ireland, Wales, Italy, France and Scotland. Big old Russian LCD! 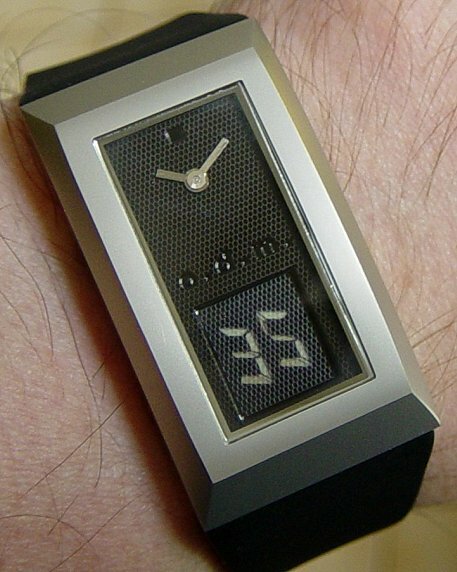 I don't know much about this watch, but the design, lack of any functions and twin-battery movement suggest to me that it's an early LCD, maybe from the early 1980's or possibly even late 1970's! 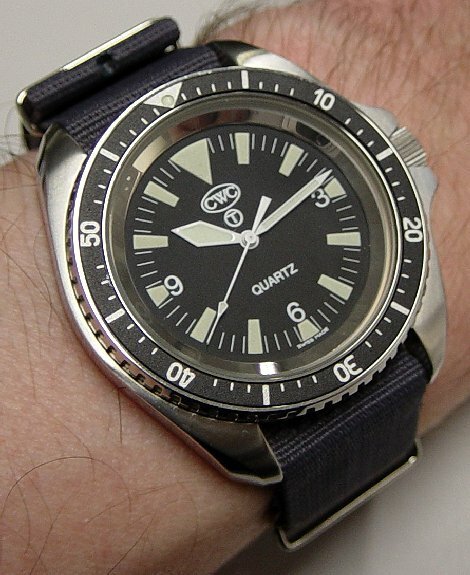 James Grahame knows much more about this watch than I do. Check out his article on retrothing.com. Another old Russian LCD from the Elektronika stable. Purchased from the Ukraine like the red one above and obviously from a similar period. 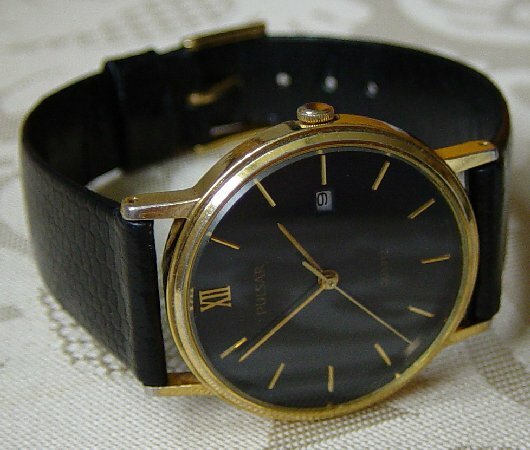 The seller of this watch believed it to be from the late 70's. The movement is very similar to the one above as well. 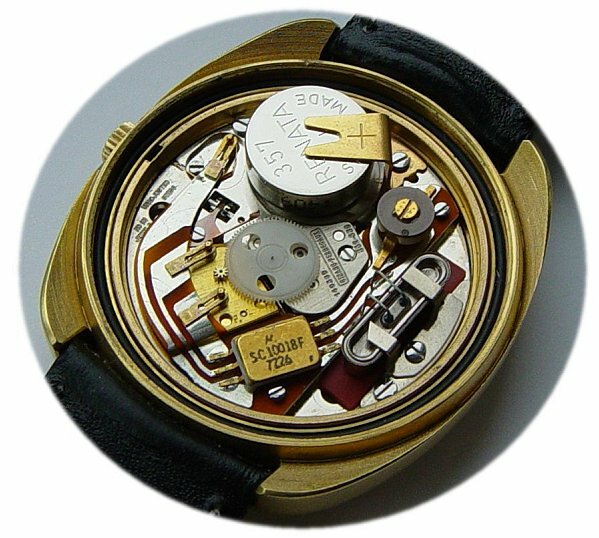 In 1969 Girard-Perregaux created a quartz movement with a frequency of 32,768 Hz which became the accepted standard for all quartz movements, even those made in the far east. 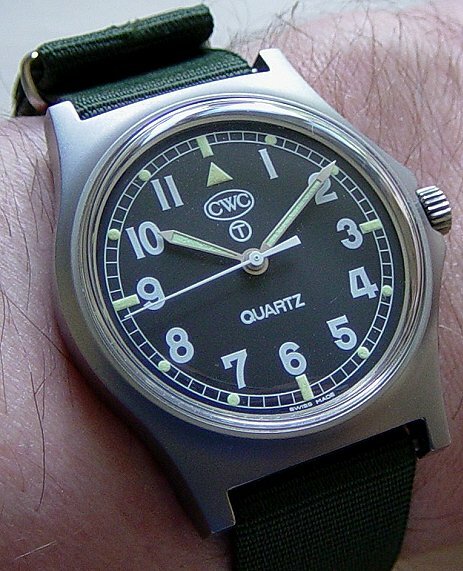 As far as I can gather, their first manufactured quartz movement was the cal. 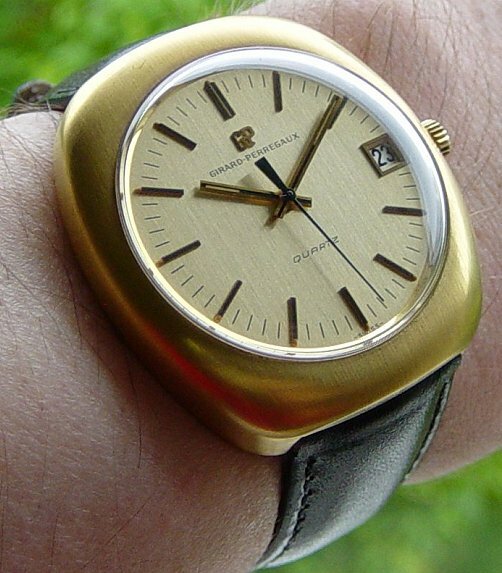 352 which went into production around 1970 which must make this one of the first ever quartz watches - outside of the laboratory anyway! The cal. 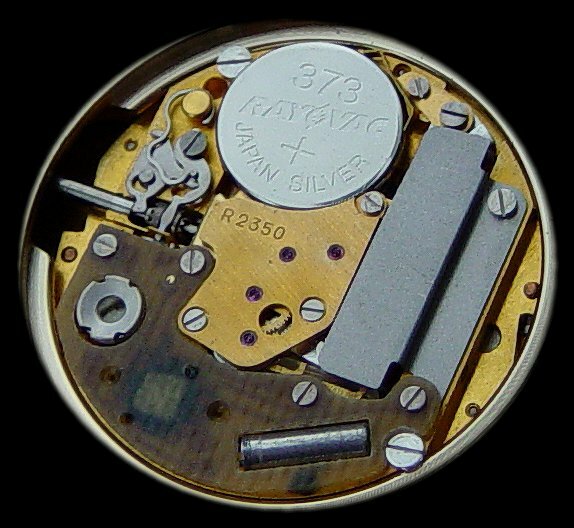 352 movement was also used by Le Coultre and Favre-Leuba. Update Nov. 2009: My thanks to Charles Carr who spotted that the dial markings are, in fact, recognised international ground-to-air signals that can be constructed by people on the ground using materials to hand to signal to overflying aircraft. 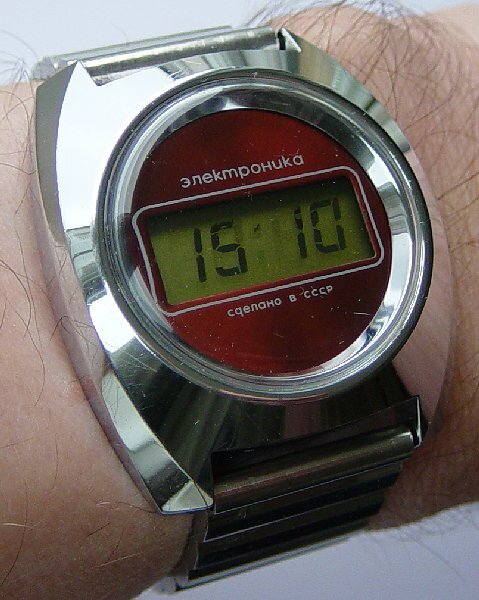 A modern Luch quartz watch similar in concept to the Raketa "Calendar". This was a nice gift from one of the RLT forum members who had been on a trip to Belarus. Shown here on a green NATO strap which I think suits it rather well. o.d.m. (Original Dynamic Minimal) watches are designed and manufactured in the Far East. Certainly minimal, the "Mysterious I" has no buttons. 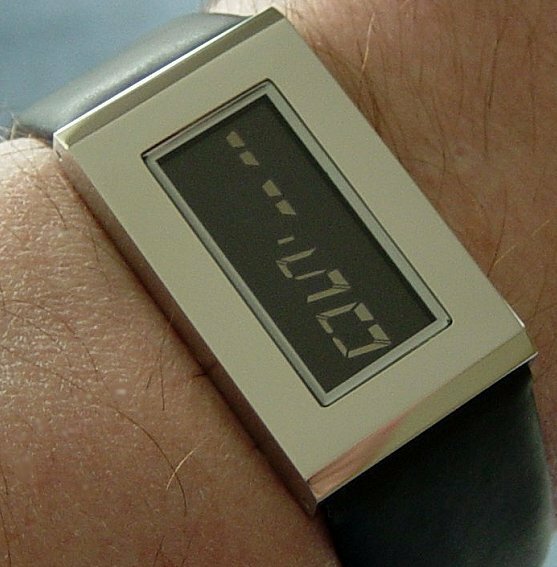 You can change between time and date on the reversed LCD display by rocking your wrist backwards or forwards. Another beautiful design from o.d.m. 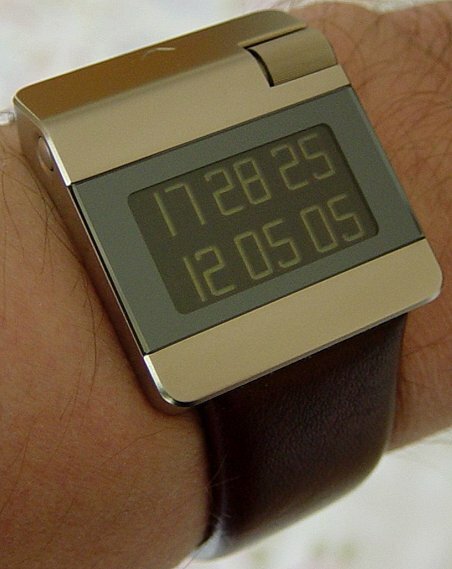 I love the look of this watch, but here I think form has taken a little too much emphasis away from function. 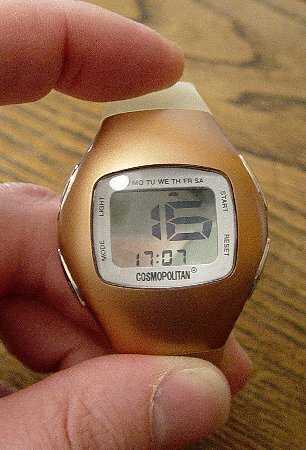 Although the digital display has several different modes (here it is showing seconds) it can only be changed by taking off the watch and operating a small recessed button on the back! Still, it certainly is a stunner! 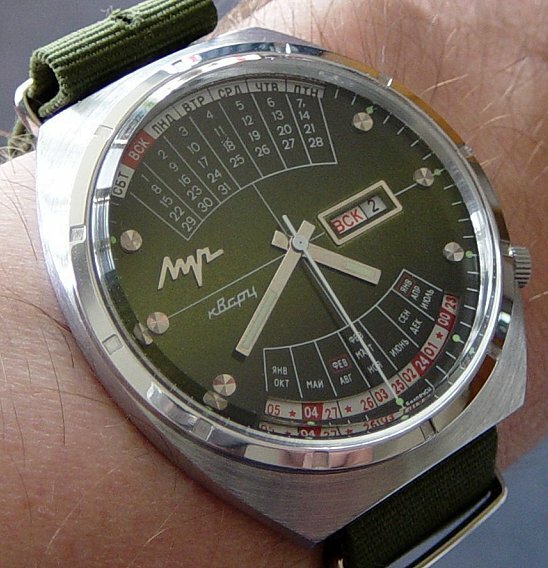 A Pulsar quartz from the mid 1980's with a 2 jewel Japanese movement. 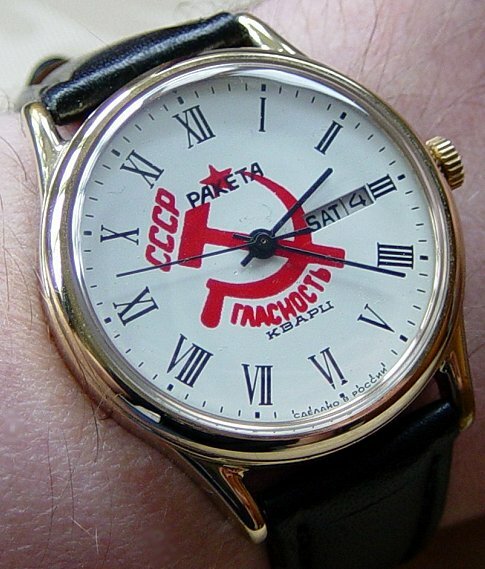 The Russians seem very fond of adorning their watches with military or political designs. 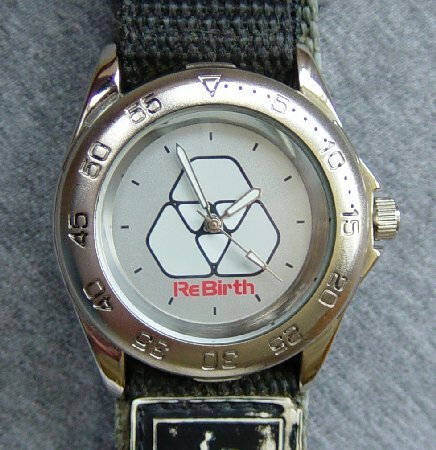 This 8 jewel quartz watch from the early to mid 1990's has a hammer and sickle logo with the word "Glasnost" printed underneath! 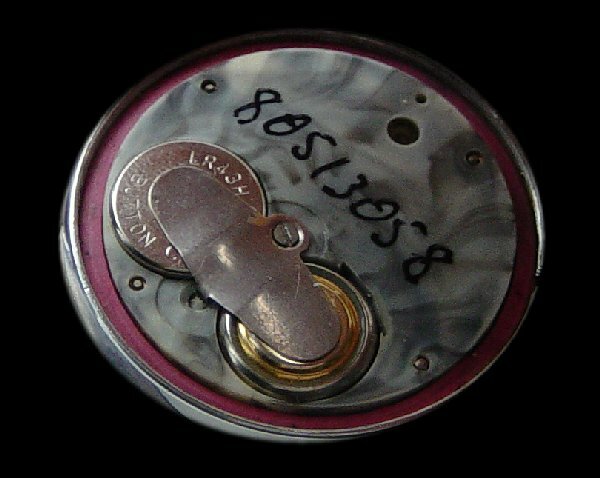 You can see a picture of the R2350 movement HERE. 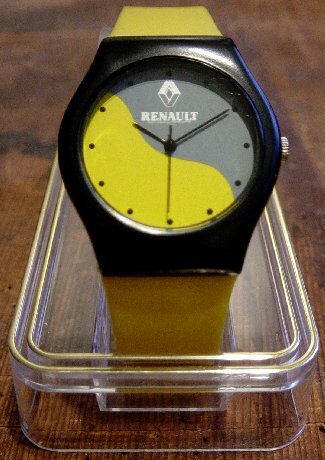 I bought this watch to "celebrate" leaving British Telecom in 1995. 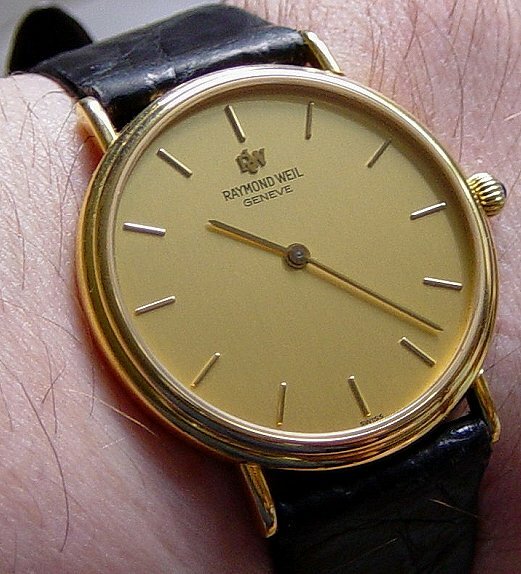 It has a mutli-jewelled Swiss quartz movement housed in an 18ct. gold case. The RLT9-GMT is similar to the standard RLT9 with a quartz Ronda 315 movement, but it features an additional inner 24hr. 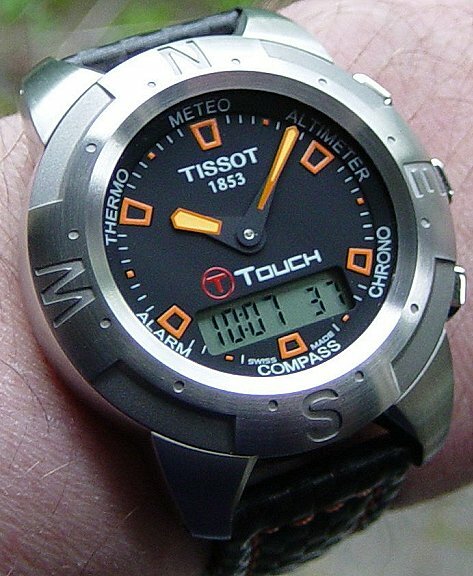 dial with independently adjustable GMT hand to provide a second time zone. This is the titanium version. 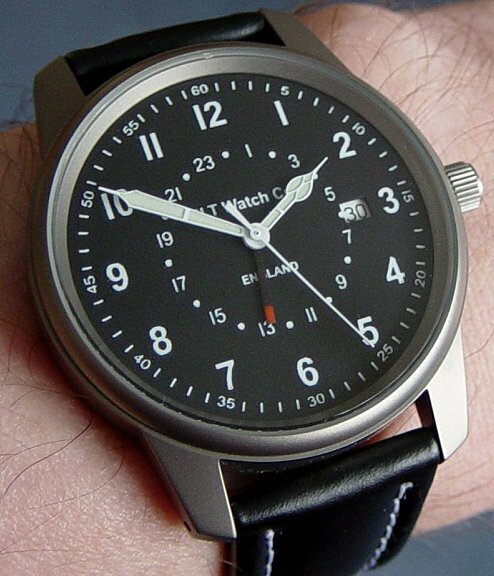 A multi-function watch with ISA quartz movement incorporating alarm / battery power reserve, constant seconds and day subdials; date window and alarm time and GMT hands. The case is 100M water resistant and has a sapphire crystal. 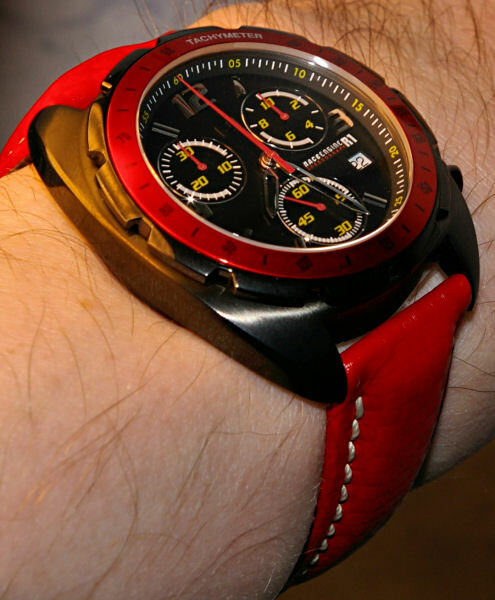 The watch is shown here on a Stingray strap custom made by Banda. Combining a large, easy-to-read LCD watch with an altimeter, barometer, thermometer and digital compass, the Suunto X-Lander is a great tool for hiking, mountain biking or climbing. The Suunto X-Lander can keep track of your activities as it features altitude log books, compass bearing tracking and barometric trend graphs. The excellent backlight means the watch can be used in the dark and battery replacement is simple as the carbon fibre caseback features a battery-hatch. The large case size means the buttons can be placed well apart which makes them quite simple to operate whilst wearing gloves. This complex instrument requires that you familiarise yourself with its many features, so RTFM is definitely recommended! The Timex Expedition WS4 takes the best features of the Avocet Vertech Alpine and Suunto X-Lander and combines them into an excellent, widescreen instrument with numerous time keeping functions, alarms, graphic displays, very accurate altimeter, barometer, thermometer and compass. 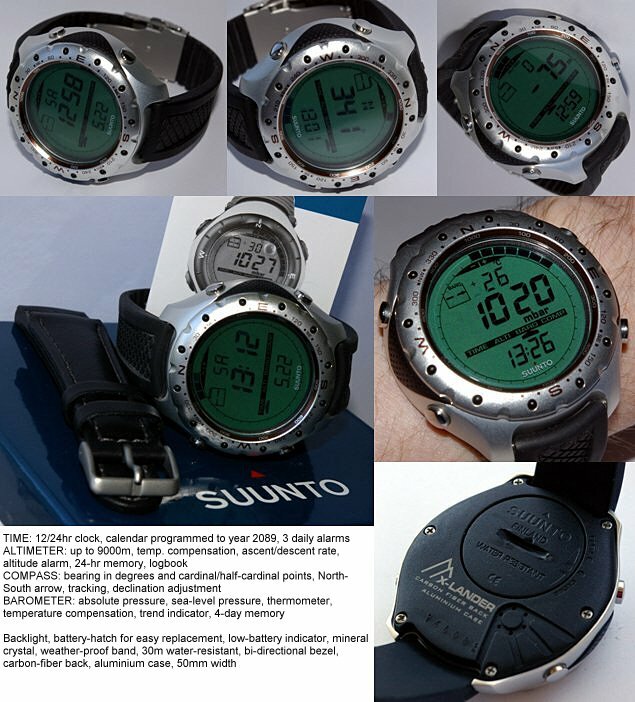 The altimeter in particular seems to require far less re-calibration than that in either the Avocet or Suunto, even when the barometric pressure changes. Quite how the Timex achieves this I don't know, but it works very well. The widescreen format also allows for on-screen prompts to be displayed which makes operation simple without necessarily having to memorise the entire manual. The large case features big, solid buttons that are easily operable with gloves and the superb Timex Indiglo backlight provides excellent visibility in dark conditions. 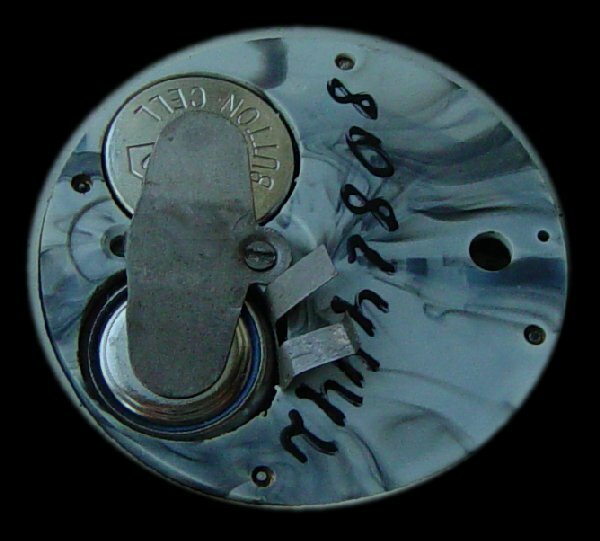 A battery hatch enables the user to change batteries without recourse to a jeweller and 50M water-resistance provides sufficient protection from rain or the occasional dunk in a stream! 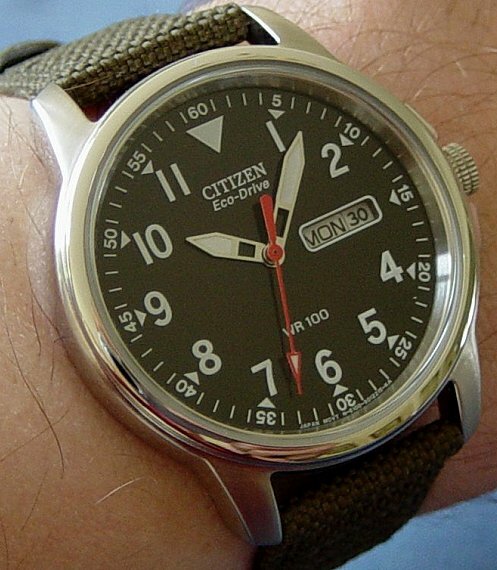 My only criticism is that the clasp on the elastic wrist-strap lacks any safety features. 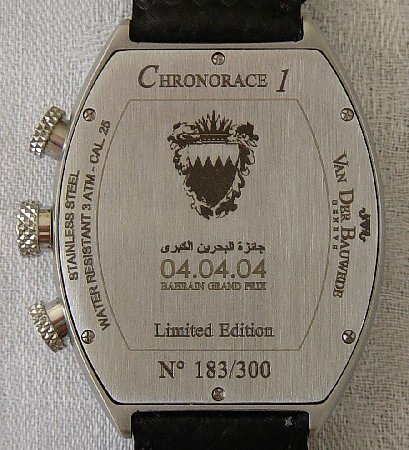 Based on the VDB Magnum GT3, this special edition is number 183 of 300 commemorating the first Bahrain Formula 1 Grand Prix held on 4th. April 2004. It utilises a 27 jewel ETA quartz movement with four stepper motors to drive the seven hands displaying the time and split-second chronograph functions. Hardly a pretty watch, but a nice souvenir all the same. 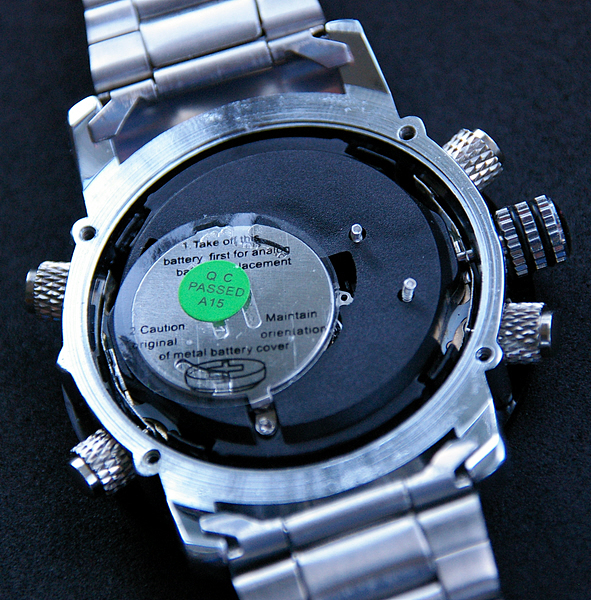 Click the following link to see the back of the watch. Straight out of one of Gerry Anderson's wildest fantasies I reckon!! An awesome combination of retro-styling and modern technology, the v-tec Alpha features a scroll-wheel driven ultra-bright display that cycles between the time in two time-zones, date, alarm, chronograph and countdown timer. You can read my review and see more pictures of this watch HERE. 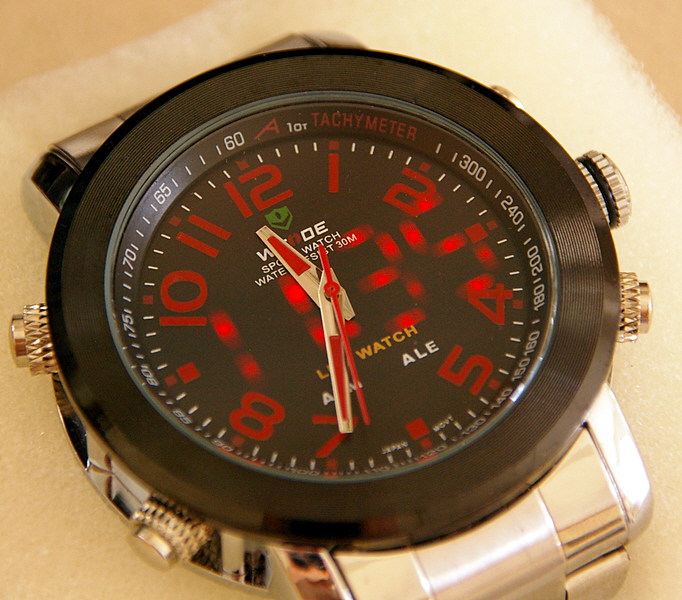 WEIDE watches are designed and made by Gauangzhou Ohsen Watch Co. Ltd. 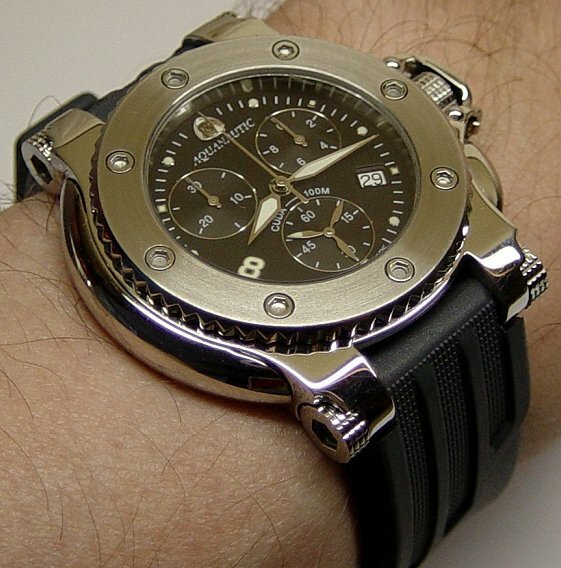 They specialise in fashionable sports/diving watches. This large (44mm wide) model is part of the "LED series" range and, unlike many Chinese fashion watches, is actually rather well put together, especially considering the price. The bracelet is of fair quality incorporating brushed centre links and a safety clasp. Inside I was pleasantly surprised to find that there wasn't a near-vacuum with a miniscule movement in the centre but a Japanese movement with additional circuitry to power the WEIDE's party trick, a hidden multi-functional LED display that's great for low-light conditions. Water-resistant to 30M we're not talking "real" dive watch capabilities here but, if you're looking for an inexpensive watch to take on holiday that'll look cool lounging on the beach, by the pool or in the bar, a sporty watch from WEIDE might well fit the bill. 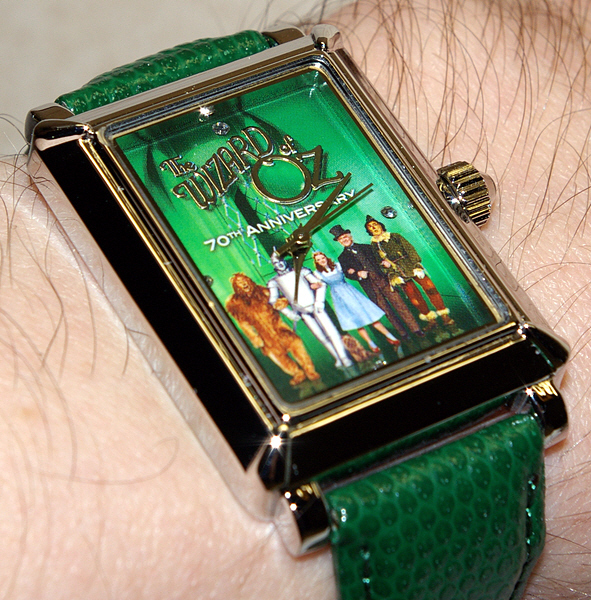 Novelty watch supplied with the "Ultimate Collector's Edition" DVD box set of "The Wizard of Oz" celebrating the movie's 70th. Anniversary. "If ever, oh ever, a WIS there was...!". Yes Watch is a Californian-based company that has used modern technology to develop a watch that tells time in a very traditional way. 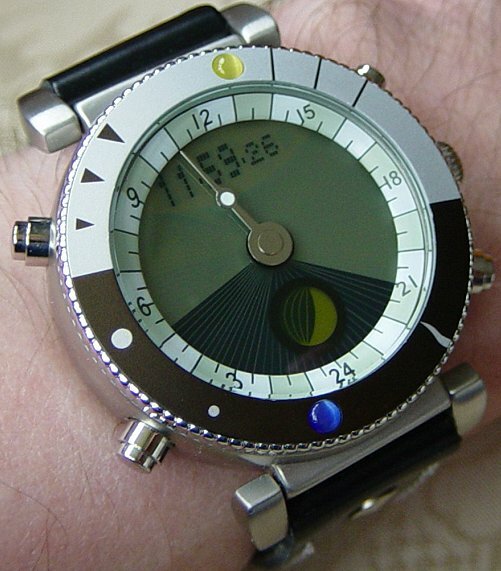 It has only one "Solar" hand that rotates about the dial once every 24 hours following the path of the sun. The background LCD display divides the dial into a light-coloured daytime area and dark-coloured night time area and incorporates a moon phase display and a standard digital read-out which can be switched off if you prefer. The watch is pre-programmed with data for 500 cities worldwide or can calculate the display based on Latitude and Longitude settings entered by the user. 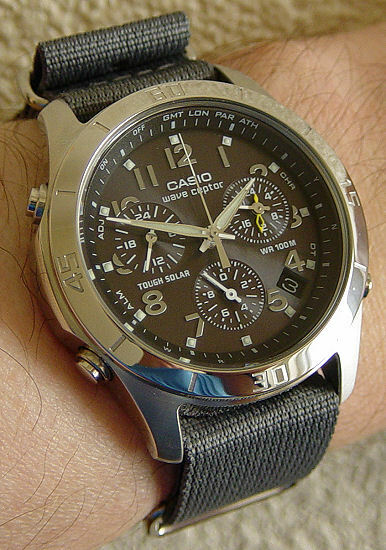 It has dual-time functionality, alarm and chronograph functions too! 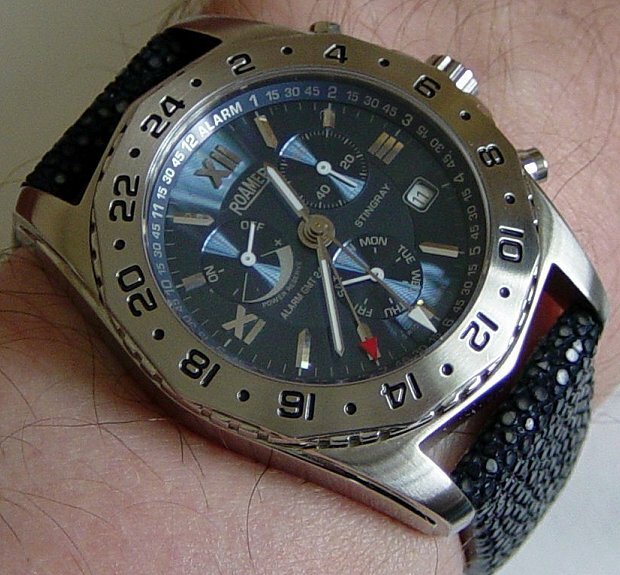 It's pictured here on an RLT Fleiger leather strap.